This is part two of an academic study of the film screening series which has been a central feature of the AMIA Student Chapter at UCLA. The first part can be found here and was written before the series began, in an effort to begin exploring programming possibilities. This retrospective piece reviews the past year using various analytical structures and anecdotal work illustrating the evolution of the series’ success. Written specifically in response to my previous piece and the evolution of the AMIA Student Chapter and the 12-screening series that we have engaged in during my tenure as the President, I wished to take a closer and more incisive study at the make-up and structure of this student group due to its direct relationship to non-profit audiovisual archival administration and the evolution of its structure from financial growth. The central methods I use to synthesize this is are Jim Collins’ work, “From Good to Great and the Social Sectors: Why Business is not the Answer: A Monograph to Accompany Good to Great : Why Some Companies Make the Leap and Others Don’t,” and SWOT analysis, adapted for our use, both crucial pieces of Snowden Becker’s MIAS240: Archival Administration course. Additionally, I have used course experiences from other classes that addressed programming issues and have tied them in together to work with our budgetary plans and future now that we have a budget (which will be looked at below). As we complete a year of the “Something Old, Something New” screening series, I feel it only fair to do a follow-up to my previous article on the AMIA Student Chapter Screening Series, a program which has now become a powerful force within the context of the Student Chapter. The series progressed far beyond what the initial presentation may have led the reader to believe. In considering the student group, this was our establishing fundraiser event, and has managed to create a treasury from which we will now be able to give future students opportunities to attend AMIA events, as voted upon by the larger student committee. Part I: Something Old, Something New: From Good, to Great! After 12 screenings, almost all double bills, featuring high-profile guest appearances, and 9 of them turning a fairly nice profit for the AMIA Student Chapter, it would initially seem that we should be very positive on business metrics and structures. On closer study, the way in which we garnered financial support and developed our identity had little to do with the AMIA Student Chapter utilizing business rules and ethics. The reality is that it was centered upon my interest in the models we studied of social institutions, archival administration and non-profit companies. 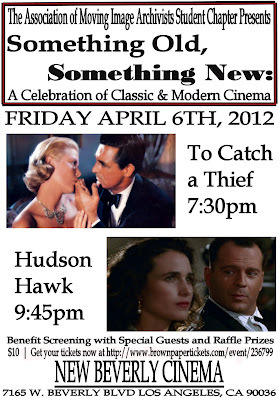 The film series I designed and curated, Something Old, Something New, was an active segment of the AMIA Student Chapter, a group whose main trajectory was not the earning of capital but the funding of student projects. Any money that was to be made was to go into educational endeavors for students involved in the AMIA group. While it certainly felt like we were were “in the money” when we saw our financial reports turn from zeroes upwards, this economic upswing only reinforced the success of the screenings and assisted in producing more energies for the next month’s work. In the beginning, my relationship with the New Beverly theater simply held that if there were any profits made from these shows, our group would receive them. We were overjoyed to see the success of my programming choices, outreach and other work that had gone into the series. But it was the reality of receiving money for student grants and activities where Jim Collins’ quote became of the utmost importance. He writes, “We must reject the idea- well-intentioned, but dead wrong-that the primary path to greatness in the social sectors is to become ‘more like a business.’ (Collins 2005) My involvement with AMIA was always one that it should not be “mediocre” like a business (as Collins goes on to say) but that it should reflect the greatness of its participants, its content and its activities. Clearly, the AMIA Student Chapter was not destined for “business” but for the arenas of the social sector. If so, we should be following that path of greatness. I feel that we have followed that journey in the manner that Collins describes. Collins’ description of the Hedgehog concept was a big driving force behind how I structured and modeled the film series. He says that the first circle is “understanding what your organization stands for (its core values) and why it exists (Its mission or core purpose).” (Collins, 2005) When I started planning, scheduling and working with the themes of this film series, it was not only personally satisfying for me, but I realized what was important for the AMIA Student Chapter. Something Old, Something New, while entertaining to the general public, was designed primarily in order to fund a Student Group. It’s secondary mission was to bring more visibility to film restoration/preservation and make certain that the AMIA Student Chapter became a student archivist group to be reckoned with. The idea that this was possible through entertainment and film audiences was refreshing. Collins discusses the idea that many social organizations felt uneasy with the second circle (the economic circle). For me, that one was vital! How else could we hope to send AMIA Student Chapter Members to our AMIA Annual Conference, The Reel Thing or the Digital Asset Symposium? The students’ presence at these conferences not only enriches their education but inspires them to bring back ideas for the Student Chapter. Additionally, their presence at conferences makes our Student Chapter and screening series known (branding)! Everyone wins! But for many non-profit groups (churches, etc) , that circle speaks too much of Big Business and the world that seems more than slightly malevolent. Money is a touchy area. But I feel confident in Collins’ Hedgehog Concept for Something Old, Something New because I have seen it work. Judging from Collins’ Hedgehog Concept, Something Old, Something New was an overwhelming success. 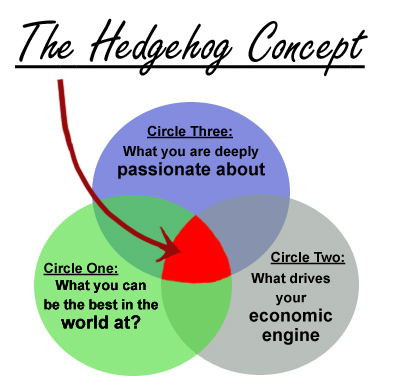 Especially within the third circle, which he describes as “Understanding what best drives your resource engine, broken into three parts: time, money, and brand.” (Collins, 2005) He mentions free labor and the amount of “sustained cash flow” and also talks about wells of supporters. For a solid year all of our fliers were designed for free by someone who honestly believes in what we are doing. Does this gentleman have time? Not really. He has a wife, kids, and is a public school teacher. Does he do it willingly? Absolutely. Besides our fliers, all of our custom trailers have been done for free by someone who also works a fulltime job and is incredibly busy. Some of our prizes have been donated by film studios but they have also been given by local establishments such as Wacko in Silver Lake, specially selected for each screening, because they are interested in showing support. Our continued presence at the New Beverly itself is a gift in and of itself. Something Old, Something New is backed by the community. People are repeat attendees at the screenings. At a repertory house, it is not difficult to recognize the same faces. Some may be friends but others are people who are fascinated with the idea of our theme or supporting UCLA’s Moving Image Archiving Students. Finally, we need to look at this series for the future. Has it been an economically viable one? Is it something that future iterations of the AMIA Student Chapter would want to continue? While it has successfully gotten us a name in the community and we have been able to get a significant profit for ourselves this past year, was this a fluke? Not really, according to Jim Collins. Something Old, Something New fits in the right area for our particular kind of administrative organization, so he writes. According to this model, our screening series falls into Quadrant III – the “clear winner” category. As defined by Collins, this area is made up of “those that blend charitable donations with business revenues. Performing arts organizations gravitate toward this quadrant, along with organizations that have created a unique business revenue stream to augment the economic component of the resource engine. Such as local Girl Scouts councils with their cookie businesses and Share Our Strength with its corporate sponsorship business. This quadrant requires both business acumen and fundraising skill.” (Collins, 2005) Due to my extensive outreach within the last year, we have been able to acquire better prices on print loans but we have also had more extensive donations from local institutions, businesses and studios for the raffle, thus enhancing our program on the whole and attracting a larger audience and increasing our ticket sales. Additionally, my consistant public relations campaign has gotten our events coverage in a variety of blogs and publications, allowing for a wider revenue stream. Throughout our entire Something Old, Something New series, it has always been a possibility of falling into one of the other areas, which in the case of the screening would mean Quadrant II, “requires funding.” This would be highly unfortunate due to the fact that our show would actually cost money to put on and be a burden on the New Beverly and its manager, Michael Torgan. In order to prevent this, it is of crucial importance that the titles and guests be very carefully selected. Film audiences have very certain ways and methods of living their film life. While they may see a film in a repeat performance, it has to be paired with something that they find to be just right. Additionally, special guests need specific treatment and in order to attract a crowd, it is advised for them to be fairly extraordinary. This special formula must be balanced right or ticket sales will reflect the mistakes. The box office will very likely have a say as to whether or not your position at the theater continues. More than anything, it is advisable to stay in Quadrant III. I am proud to say that throughout my work as the President, we have remained financially solvent and maintained a strong position there since our very first screening. At the point that this first piece had been written, the series was based upon various local conjectures and professional conversations that had gone on within my experience in the MIAS program. One of the primary experiential forces behind the design of the series was a visit to the Academy of Moving Image Arts and Sciences for a class: MIAS 250: Access to Moving Image Collections, taught by Mark Quigley also during the Winter of 2012. The individuals who came and spoke to our class included local film curators and programmers from all over Los Angeles: Adam Hyman from the Los Angeles Filmforum, May Haduong from the Academy, Gwen Deglise from the American Cinematheque, and Shannon Kelley of the UCLA Film and Television Archive. The primary subjects of conversation during our visit were film access and theatrical exhibition. While each person came from different backgrounds and worked with very different audiences and settings (the Los Angeles Filmforum shows are critically different and attract a much more niche audience than that of the American Cinematheque) what the discussion mapped out for the AMIA Student Chapter screening series was vital. Each figure discussed the ways exhibition and audience attendance worked at their particular location(s) and shows and how they went about handling print rentals, client and location relations, format issues/technology and where theatrical may be going in the digital future. Gwen discussed certain guest issues, mentioning that even if you get a very well-known and famous figure like Samuel Jackson, that doesn’t guarantee a sell-out crowd. She said that she was surprised at the turnout during that event. The structure of each event and how they are booked, from guests, to prints, to venue are dependent on various factors. Each programmer agreed on these factors and there was a consensus that, to an extent, theatrical exhibition in this modern age can be quite volatile. One fact that all of the programmers agreed upon was the amount of time needed for “pre-planning.” While each venue had a different calendar based upon the time necessary to get their physical calendars printed and/or online, Shannon and Gwen both emphasized that the more time a programmer has to do publicity, the better the turn-out. This was one of the key recommendations I applied to the Something Old, Something New series. Based upon Shannon and Gwen’s timeline, I felt it necessary to conduct all of our business as soon as possible, so a month in advance was the ideal starting point. However, in speaking to Michael Torgan of the New Beverly, that was not always possible. We had to work with the venue’s schedule at all times and, of course, deal with print coordination. In order to get things done as fast as possible, differentiate our organization, and “brand” the AMIA Student Chapter for the Something Old, Something New series, I made the effort to book as many prints as I could myself. It took the weight off Michael’s shoulders and, in certain cases, I was able to discuss the educational properties of the program we were planning with those who were familiar with the AMIA organization and the New Beverly. Many times these individuals were amenable to some financial discounts due to the fact that these screenings were benefit screenings for the student chapter and served an educational purpose. Outreach and promotion were most essential to the series as was looking at the event calendars of other theaters, both online and in print. The screening for our first event was incredibly successful. As previously noted, it established our basic format for every successive screening. We had a flyer that we pinned up around campus, distributed in local stores and film establishments and I also posted this in online social networking sites such as Facebook, Twitter and our blog. We had a Q&A that we filmed at the show, complete with the raffle, and the entire board participated with great fervor! Once the event was over, Brendan Lucas, one of the board members, collected all of these archival materials and inserted them into a blog so that we could further our branding and advertise the next show since we had already set the dates for it and booked the 35mm prints. For our next show, I felt that we wanted to go a little further. I knew The Cinefamily theater has had great success with specialization and creativity in their marketing. Their model is admirable and has been well-received all over Los Angeles as well as in other markets, and their head programmer, Hadrian Belove spoke at the Arthouse Convergence on various panels and subjects this last year. One of their areas of expertise is their “custom trailers.” Not only are these features endlessly entertaining, but they reimagine moving images in a new and different manner alongside interesting aural works. I felt that since our trajectory was the appreciation of older and newer films, why not “borrow” this structure and use it for our series? The idea itself is nothing new. It is a highly utilized fandom tactic, placing well-loved music to well-loved moving image works. But the trick is to do it with finesse. I located an associate who I knew was highly capable of doing this kind of creative work, and he has produced every one of our custom trailers since then. We have come a long way from our first screening and from the first academic exploration I did in regards to the screening series. As can be seen in the previous work on this topic, we were just preparing to present the first show. As of May 2013, we have been written about in the Los Angeles Times by Kenneth Turan, been interviewed for a Los Angeles online business journal, had guests as diverse as acclaimed editor Paul Hirsch, director Joe Dante and actor Ron Perlman (among others), and co-presented a film with the very well-respected Drafthouse Films. To quote one of our audience members after a screening: “I’d never heard of AMIA before you began doing these shows and now I know who you are and think you’re great!” Our public expansion and visibility has grown in tandem with our financial assets. Although not every show has been financially successful, we are now at a point of economic stability in which we will be able to finally offer funds to students for AMIA event/conference attendance, which was one of the major goals that we had set out for ourselves. Our newly gained prominence in the community and financial solidity means that Something Old, Something New has succeeded in its intended goals! So what next? The next step centered upon monetary decisions. Finances were both a matter of priority and consequence since, up until this point, there had never been enough money in the treasury to make a difference. We asked for advice from several other student groups on campus, but they also had never been in the position of having large quantities of money so they did not have much advice to give. It seemed that the AMIA Student Chapter, due to this financial position, had broken new ground within the Information Studies student groups via fundraising decisions. After meeting as a board and discussing the issue with the Chapter advisor, we concluded that we needed to make immediate decisions about how to deal with our financial assets. The final conclusion was that we wanted to maintain at least a modicum of funds within our account and use the rest to fund the students for the grants and AMIA event assistance as planned. A certain “buffer” in our account was crucial for our own security and to cover assorted Student Chapter activities, events, or necessities such as refreshments for East Meets West, the AMIA Student Chapter yearly meet-up at the Annual Conference, or reimbursements for copies made for the flyers and PR materials for the Something Old, Something New screenings. After a certain amount is decided upon as the account “base,” the remainder is to be dispersed however the students in the larger AMIA Student Chapter sees fit, for AMIA events only, and for AMIA members only, beginning next year. A poll has been sent out to the students and the larger group meeting has decided how they wish to handle the funds. Disbursement will take place beginning next year and will be handled with next year’s board and advisor, who I have complete faith will do it with the utmost care and ability. The success of these screenings are based on a three-pronged approach. First, there is what I refer to as “audience cross-pollination.” In the initial discussions on the series, those of us on the AMIA Student Chapter board discussed how certain audiences watch older films and rarely watch newer films, while likewise, a large percentage of newer-film watching audience members rarely attend or watch older films. While we were unable to locate statistics or specific analyses backing up our hypothesis, our personal experiences regularly supported what we suspected to be true. For many of us who loved classic works, we talked at that meeting about how difficult it was to take friends to an older film, (especially in black-and-white). We also groused about the fact that many of our parents or other relatives categorically refused to watch modern works, thinking that the content was not as worthwhile as that which was made in the “good old days.” Thus, the basic intention for this series was to break these barriers and try to “cross-pollinate” the audiences, hoping that the audiences from the first show stayed through the second, since the theme would connect the two films and curiosity can be a powerful force. As the series played out, it didn’t always work, but it has worked a good percentage of the time. Additionally, on a purely financial note, those audience members who skipped the first film and only came to see the second were allowing us extra profits in the circumstances where the house was full! If people left at intermission, that freed up seats for others which, subsequently, meant double ticket sales and more money for the AMIA Student Chapter. Our second tenet is highlighting the importance of theatrical exhibition and the experience of viewing a film with other people. Presenting this to our audience, and reminding them about the difference between home entertainment and seeing films with strangers, has actually produced a response. Sometimes applause and sometimes nods come from the audience, which is certainly an acknowledgement that the evening that we are providing for them is not a waste of their time or ours. The third aspect to showcase in our presentation is format. Because the New Beverly is a 35mm theater, we like to discuss the concept of 35mm for a brief moment since it is part of moving image preservation and our educational process. Certain shows have also had the involvement of the Library of Congress who have sent us materials in order to discuss the National Film Registry. This has also given us the opportunity to emphasize the importance of moving image archiving and the ways that the public themselves can become involved through voting on the NFR. rambunctious children, crying babies, their neighbors’ conversations, ringing cell phones) that distracts them from absorption in the cinema experience. Due to the New Beverly’s (and my own personal) feelings on the matter, we made sure to announce and request that the audience shut off all cellular devices before each show began and limit the amount of talking and whispering. We explained the tie-in to the experience of watching a film and that it was a key aspect of the theater experience and this worked quite well. Experiencing other audiences around town in other repertory theaters, who did not seem to have the same response to these same requests, made me appreciate what was being built here. This led me to think that whether it was the choice of venue (New Beverly) or the respect for the evening’s program and guest (AMIA and theme/content), we had something quite unique going that was bringing in a very dedicated and loyal audience. As we shifted up our themes over the year, we also had to confront issues of print availability, print rentals/pricing and whether we wished to make money or put on a good show. There were certain circumstances where there was a choice between one or the other. The price of the 35mm prints would have made the show an incredible event, but the Student Chapter would not have benefitted financially after the print was paid for. There were a few times when this option was chosen because it was appreciated by the attendees and we were able to get good guests to attend alongside with the screening. Obtaining a well-known guest for an appearance gave us a higher chance for the accrument of financial benefits due to the number of tickets sold. Not only that, but even if the ticket sales only grant us the ability to break even, a good guest will always provide us with wonderful moving image archive material. We have recorded almost every Q&A that has been done and received a signed waiver from each celebrity guest that allows us to use the footage for our blog. However, these kinds of “high visibility/non-profit”-making decisions were very meticulously made and had to be carefully balanced alongside our surefire winners. We had to gauge them on a kind of investment matrix that explored the various kinds of investment and weighed them alongside relevance. Clearly, if we could have, we would have stayed in the area of high relevance and high investment all the time, but that’s just not possible with film exhibition. Sometimes screenings involve a little bit of “give.” Certain titles cost more for the rental than we may have sold tickets for. The shipping and the cost of a two-day 35mm print rental, even playing for multiple showings, did not make its money back. However, perhaps the obscurity of a given title or the fact that it rarely plays theatrically will increase the notability of our program, giving us high marks in the strategic relevance area. Additionally, the audience member who did attend may bring their friends back for the next month’s screening based upon what they had experienced. What the AMIA Student Chapter tried to stay away from was title combinations that were low investment and low relevance and, for the most part, we did. Only one event in our entire history had unreasonably poor attendance, and after speaking to an industry professional, they informed me that the elections that month had really affected the theatrical box office sales for everyone, not just us. It was reassuring to know that it wasn’t our content! In order for this series to continue and for the Student Chapter to pursue an advantageous (and financially beneficial) future with a screening series, as the Student Chapter president and the Film Series curator/programmer, I feel that it is essential to perform a SWOT (Strengths, Weaknesses, Opportunities, Threats) analysis in order to learn and move forward from this positive and very successful experience. The goal is to make it even more fruitful for the moving image archiving community on the whole while moving forward. 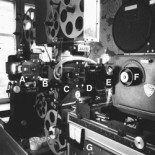 Since analyzing strengths is centered internally, one of our most dynamic strengths was our specific expertise in the subject of film history, archiving and local film audience make-up and local theater “personality.” These things allowed for better programming choices and interplay between the programming bodies of the different theaters if that need came about. Other strengths included our vastly different approach to film pairings and our individual and unique series “flavor.” This double-feature combination had never been a “theme” for any theater in the area and was of interest to a variety of people from general public to celebrities to journalists. We have strong backing in the support of the AMIA Student Chapter name: without the student group affiliation, we would not have been able to secure a variety of the film prints or prizes that we received. This association cannot be overstated, and neither can than the presentation structure of the screenings themselves. The involvement of celebrities of all kinds: writers, editors, academics and actors as participants have established this series as a highly regarded and respected part of the New Beverly calendar. Monetarily, we were debt-free from the start and able to broker a deal with our venue that allowed us partial profits from the screenings as long as it did not cost the New Beverly themselves and our participation did not end up “costing” them. One of the major strengths that we had was UCLA’s name. Film restoration and UCLA in tandem are quite a draw for a repertory theater, thus bringing many people out. There are many areas to improve on. Since this has been a monthly program, it has been difficult to diversify and disperse the workflow. One of the best things that could happen would be to have different teams for each part of the planning process. A public relations team is needed to contact radio, journalism, and online reps as well as select and procure a guest for the screening. An internal design team is needed for the flyers and custom trailers and let-in music. If there is none to be found, there should be a team that is selected to locate people to do these things. More than anything, selection and procurement of content should be much more communally done. While it is not a job for a large group (programming with large groups of people can easily turn into a “too many cooks in the kitchen” scenario), it should be a job for the entirety of the AMIA Student Chapter board, and it should be a fun but highly meticulous and constructive decision-making experience, based on regular film-going and experience in Los Angeles theatrical exhibition life as well as personal choices and availability. The Voice of everyone on the board should be heard. The weakest part of resurrecting the AMIA Student Chapter was that in order to do so, there were many instances where I had to take charge and I regret not having the time to construct more activities where there was more communal engagement. I dearly hope that upon my departure this is what will occur. This was the biggest weakness of the screening series. The AMIA Student Chapter has many options for the screening series. They could continue with it in this form, or they could evolve it into a different double-feature combination and make it their own, depending on the participants involved. There is more funding involved that we did not access this year that is specifically allowed for student groups and could be utilized for a group such as the Student Chapter. If it was decided upon, those funds could increase or make the screening more enjoyable by adding an opening night party somewhere with those funds, charging admission fees, and planning a fundraising event with that. The opportunities are endless. While these funds would be used and spent, they might, in fact, be used to get more funds back. There is also the opportunity to cut back on the film series in its monthly schedule and do it quarterly, making it more anticipated and more carefully planned event. This way it could be a more rare, highlighted event and give the planners more time for all its requirements, and perhaps even explore the possibility of gaining sponsorships or other financial opportunities. The AMIA Student Chapter name goes a long way in the Los Angeles moving image community, and if used in tandem with great works, it can make magic happen. The biggest threat is leaving the film series behind and not keeping up with it. If this film series does not continue, there is a high-level threat of no funding for the Student Chapter unless they can come up with an equal (or better) way of getting monies into the treasury. The opportunity that has been given to us through the venue we have is priceless and should not be lost. If that partnership is somehow dropped or not followed through on, it may be a financial loss for the Chapter and a cultural loss for the moving image exhibition community of Los Angeles. Additionally, there has been more press recently for the AMIA Student Chapter than ever before. If the screening series drops off without a sound, it risks a similar invisibility as it had from a few years back, while the NYU and Eastman House Chapters continue to flourish. Something Old, Something New has been one of the most special events that I have participated in within my graduate school experience, partially due to my own sentimental attachment to the New Beverly Cinema and partially due to my evolution and growth as an active leader in the film archiving community during my past two years in the Moving Image Archive Studies program. Being able to screen films for an audience first hand and learning how the film exhibition community works firsthand is one of the most enjoyable experiences I have had, especially since it has benefitted the AMIA Student Chapter. The way this program seems to me is that it is just getting going. With the right tools and energies it could become something greater than what it has been if (for no other reason) there would be more people devoting their time and energies to it. Los Angeles is in need of the AMIA Student Chapter for a bridge between the public and private sectors. Keeping preservation and restoration knowledge secreted away doesn’t do film fans any more good than it does the archival community who will eventually be requiring those same fans’ funds for projects. Establishing connections sooner rather than later is the best way to go and I believe that starting a film series like this is one small step in a much larger path and that every movement forward helps. Collins, J.C. Good to Great and the Social Sectors: Why Business Thinking is Not the Answer: A Monograph to Accompany Good to Great: Why Some Companies Make the Leap–and Others Don’t. Boulder, CO: J. Collins, 2005. This entry was posted on May 2, 2013 by sinaphile in Access, Film Exhibition and tagged 35mm screenings, AMIA student chapter, arthouse convergence, audience attendance, box office, branding, cinefamily, community volunteers, curation, exhibition, film curation, film programming, guest appearances, NATO, networking, New Beverly cinema, Partnerships, public relations, Q&A, social engagement, something old something new, SWOT analysis, UCLA Moving Image Archive Studies.